Okay! 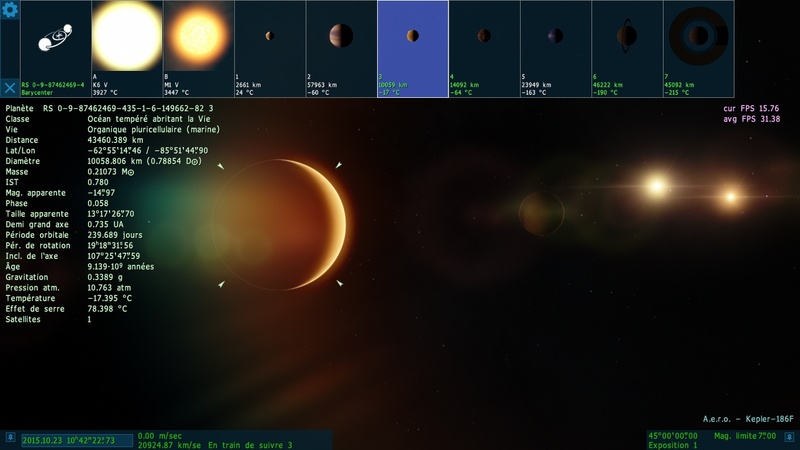 This challenge will involve the hard task of finding a beautiful system with a planet that has life! - If you are unsatisfied with your system, you're in luck; Lunar systems are legible too, only if the host planet or one of the moons harbor life. I never specified planetary systems. - If in a binary system, the system with life in it is the applicable system. the system orbiting the neighboring star is invalid. - If in a binary system, and both stars hold a planet with life, one system must be picked over another. Welcome to Calypsa ! a cool planet with unicellular LIFE and beautifull rings . 4 cool sellenia turn around. I have not quite understood, it should take the planet with life on the main star of the system ? And can put you screenshots to explain this ? I want not worry about others but it remains that 3 days (with one ci account) view that there only a screenshot. Also is that the planet and its satellite looks like the Pluto-Charon system, in effect, the satellite and the ocean is always shows the same face between them and this system turn around a binary system. I use SE 0.9.7.4 pach 7. 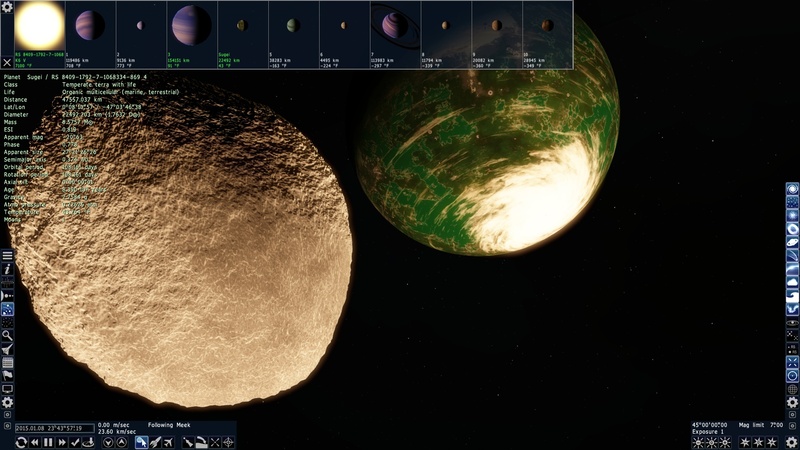 Do I need to provide a screen shot of each of the planets? Or just an image of the list of planets, and a screenshot of the life planets? 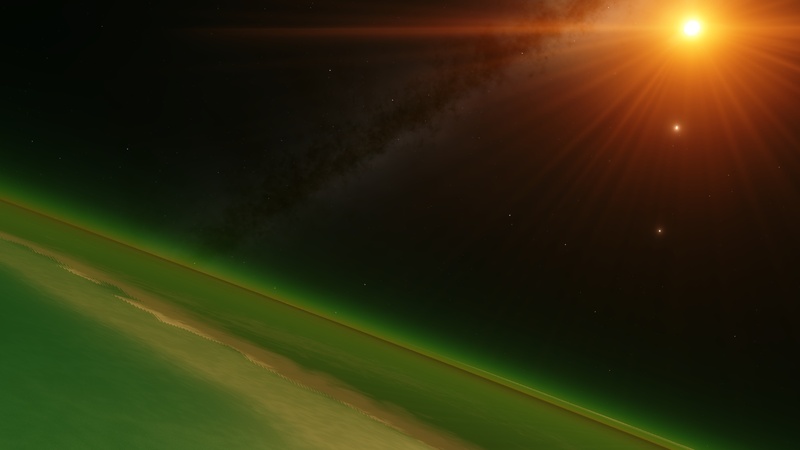 I have taken on the surface of the planet and its satellite, but it is not required, at least take a picture of the planet with life and you need to do only one choice if the system has several world with life, as you can see in my previous post, the system where I had four planets with life and I chose the ocean. But personally, it would be great if you can take the view from the surface of the planet with life (and his body "suburb" for we realize what has on the surface of the planet) of course, it does not take too much, I would say 4 maximum. 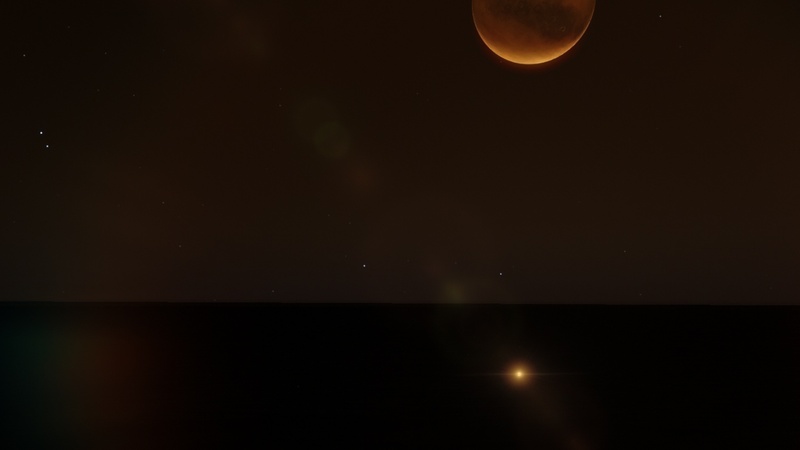 I also think that you should put any version of Space Engine you use because if the contest organizer (Tac1017) is not the same as you, may see something else. Otherwise contact the organizer of the contest if it is possible to see if my answer is correct and for more information. I hope I helped you and I wish you good hunting to find the other inhabitants of the universe. This is my admission. The planet Sugei, moon Meek. Appears tidally locked. You can see the shoreline and the sky and oceans green tint. Better view of the difference between the perpetual light and dark sides. With the moon Meek and star Polaris in view. Better view of the main storm system on the surface. Pretty planet but I know not if it's too late because it ends today but morning or afternoon, otherwise, I think that you have for me the world 1 ranking. In fact, we are only 3 so we are all on the podium? 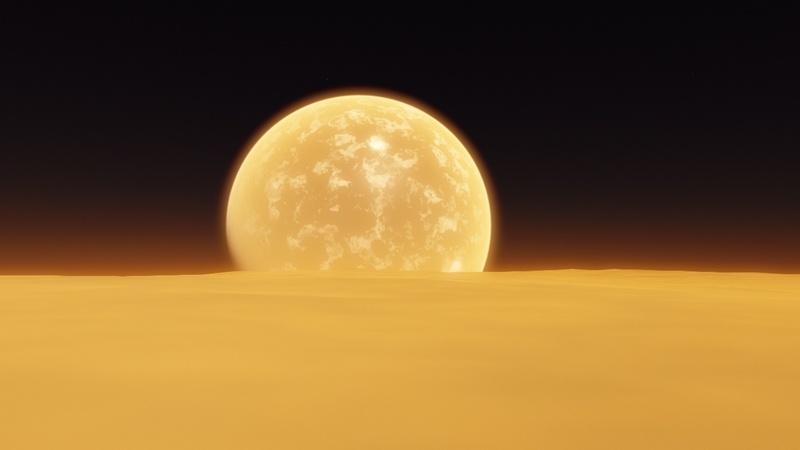 Pity, I wanted there more picture, certainly I would maybe not on the podium if there was more but at least, us discovering the most beautiful place of the universe with Space Engine. As they say, the main is to participate. 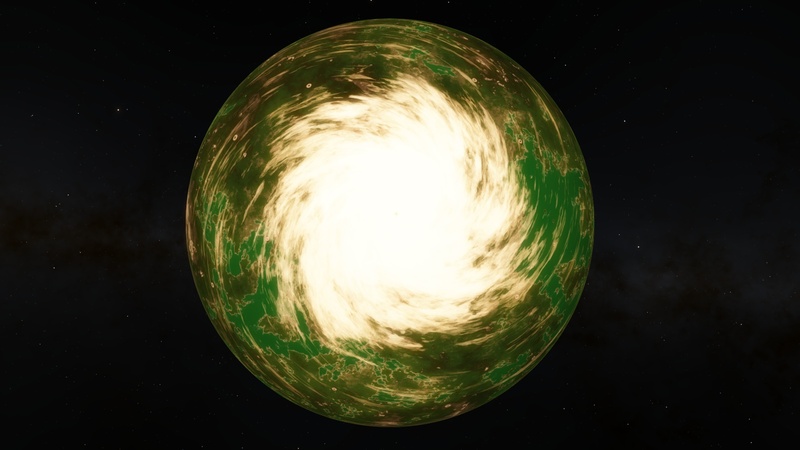 I just noticed but it's too late that my ocean, so I would have substituted the Terra I put on this post: My latest finding that's earth-like but hey, it's the rules. Okay! submissions closed. Voting sessions for one week! Tac1017, those who put the planets have the right to vote or not (if yes, you can vote to either even though I think not) ? And how it goes the votes, it is displaying the first in last because for the vote rings, I see numbers after the name, what it is ? I don't see a thread concerning how the votes, just how to organize. Yes. you're allowed to vote if you entered. Suggestion is to make people realize better what the vote, you can if it is possible to modified the name of the thread or the description that it is voting, it attracted more voting I think. 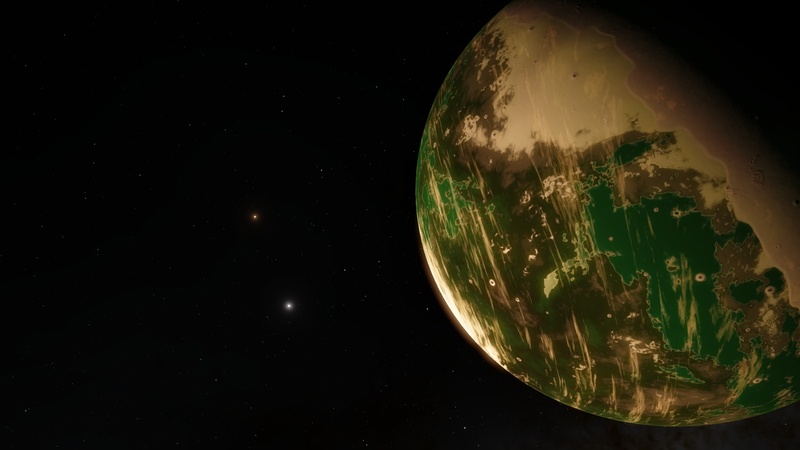 Also after this is done (at the end of the voting and outcome(/result)), after, we could rename it but more challenge but just like ca for the most beautiful planets sheltering life but that it includes all type of life. In addition I do not know if it's coincidence but the first to find a desert with life on terrestrial, me an ocean with living marine and the last as a combination of the 2 a Terra with marine and terrestrial life .